Initially, manipulate whole heads (e.g., the anterior fourth of the larva) rather than brains. Proceed with batches of three to five heads of a particular genotype through to at least step 7 before starting on a second batch of either the same or a different genotype. The aim is to minimize the time spent on dissection initially so as to get the tissue into fixative as quickly as possible. Quick fixation helps to maintain good spindle morphology; it may be less important for other mitotic structures/epitopes. "Studies that include immunostainings of whole-mount larval brains. fcAnti-3F3/2 antibody recognizes conserved phosphoepitopes on kinetochores not yet attached to spindle microtubules. The epitopes are apparently sensitive to mechanical tension and normally disappear from the kinetochore at the onset of anaphase (see ref. 21). 1. Wash three to five third instar larvae of the desired genotype in PBS to remove any adhering food. 2. Using two pairs of fine forceps, remove the "head" from each larva in fresh PBS. Grasp a larva with one pair of forceps about one-quarter of the way from the anterior end. Grasp the larva with a second pair of forceps just posterior to the first pair, and pull the forceps in opposite directions to open the larva. Do not bother to dissect out the brain at this time. However, make sure that the brain is sufficiently exposed so that it is readily bathed in fixative. This may require tearing and pulling back some of the larval cuticle and partially everting the anterior tissues. 3. Immediately after each dissection, transfer the head to a glass scintillation or similar vial containing approx 2 mL of fixative. Fix the heads for 15-20 min, gently swirling every few minutes. The goal is to dissect all the heads within 5 min so that the first head is fixed for 20 min and the last for approx 15 min. 4. Carefully remove the fixative with a Pipetman or Pasteur pipet and then quickly rinse the heads twice in 2 mL of PBS, and then wash once in 2 mL of PBS for at least 5 min. 5. Transfer a single head to a dissection dish (or Petri dish) with fresh PBS and dissect out the brain and remove any attached imaginal discs and other unwanted material. Transfer the brain to a 1.5-mL microcentrifuge tube containing 1 mL of PBST. Repeat this dissection step for the remaining brains, placing them all together in the same microcentrifuge tube. 6. Remove the PBST and replace with 1 mL of permeabilization solution. Incubate for 10 min on a blood mixer/rotating wheel. 7. Remove the permeabilization solution and replace with 1 mL blocking solution. Incubate for 30-60 min at room temperature on a rotating wheel. 8. Incubate the brains in 1 mL of blocking solution containing an appropriate dilution of primary antibodies (see Note 9). Incubate overnight at 4°C with gentle agitation. If you intend to stain the DNA with PI (or other fluorochrome that binds RNA as well as DNA), include RNase A to a final concentration of 0.5-1 mg/mL (see Note 10). 9. Remove the primary antibodies and wash the brains six times in PBST at room temperature, 10 min each wash on a rotating wheel. Be careful not to discard any brains with the used wash solution. 10. After removing the final wash of step 9, add 1 mL of blocking solution and an appropriate concentration of fluorophore-conjugated secondary antibodies (see Notes 9 and 11). Incubate the brains for 2-4 h at room temperature on a rotating wheel. In this and all subsequent steps, keep the tubes in the dark (e.g., wrapped in aluminum foil) as much as possible. 11. Remove the secondary antibodies and wash the brains four times in PBST, 15 min each wash.
12. Wash the brains twice in PBS, 15 min each wash on a rotating wheel. 13. If staining the DNA with PI, incubate the brains in PBS containing 1/1000 concentration of PI solution for 5 min. 14. Remove the PI solution and rinse the brains in PBS. 15. Mount each brain on a clean, dust-free cover slip in Vectashield mounting medium with its ventral side facing the cover slip. Gently lower a clean slide onto the cover slip until it touches the mounting medium, and then pick up the cover slip with the slide. Seal the edges of the cover slip with clear nail polish and view using a laser scanning confocal microscope. 1. It is often assumed that all cells of the larval CNS are diploid. However, there is evidence for some brain cells normally becoming polyploid. First, DNA-Feul-gen cytophotometric analyses of nuclear DNA content showed instances of 8C nuclei among expected 2C and 4C nuclei (the latter would correspond to cells in G2) in a population of D. melanogaster larval neural cells (22). Second, certain glial cells in abdominal neuromeres A3-7 were observed to replicate their DNA apparently without dividing during larval life (23). Such cells, and possibly others elsewhere in the larval CNS, may be endoreplicating. 2. PBS tablets (e.g., Sigma-Aldrich or Oxoid) are very convenient for making PBS solutions. Simply dissolve the tablets in distilled water and autoclave. 3. Triton X-100 can be used as a detergent in place of Tween-20 at the same concentration. 4. There are two ways to prepare the fixative. In the first, adjust the pH of approx 12 mL of fresh 37% (w/v) formaldehyde to pH 7.5 and then mix 2.7 mL with EGTA, pH 7.5, and PBS, pH 7.5, as described in item 7; Or mix 2.7 mL of fresh 37% formaldehyde (not pH adjusted) with EGTA and approx 6 mL of PBS and then adjust the pH with drops of a 1.4 : 1 (v/v) solution of 1 N NaOH : 1 N KOH (12). 5. EGTA is very acidic and only slightly soluble in water at this concentration. However, it will go into solution at higher pH. To make 50 mL of 100 mM EGTA, add 1.9 g of EGTA (Sigma-Aldrich) to 40 mL of water. On a stirrer, add 10 N NaOH until the solution begins to clear and then add 1 N NaOH dropwise to achieve pH 7.5. Add water to 50 mL. Store at 4°C. 6. Fetal calf serum (FCS) is a rich growth medium, so it is important to keep the blocking solution free of microbes. If the blocking solution has been exposed to nonsterile conditions and then left for many weeks at 4°C, it is worth passing it again through a 0.2-|jm syringe filter. 7. The Developmental Studies Hybridoma Bank (DSHB) at the University of Iowa, Iowa City, is an excellent source of inexpensive monoclonal antibodies (discounted for educational, nonprofit institutions). DSHB carries many monoclonals raised against Drosophila proteins, including some directly relevant to cell cycle studies (available at www.uiowa.edu/~dshbwww). 8. When starting out, try using antibodies against a-tubulin to stain the spindle (see Table 1) and propidium iodide to stain the DNA of wild-type brains. 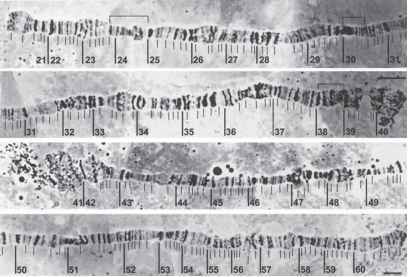 Metaphase and anaphase spindles are fairly easy to identify down the microscope, and if your spindles are not bipolar and nicely formed, then your fixation may be suspect. 9. Dilutions will vary depending on the titer of the primary and secondary antibodies and must be determined experimentally. Typically, dilutions of secondary antibodies will be in the range of 100-fold to 500-fold, but follow the supplier's guidelines. 10. RNase can be added instead to the incubation with secondary antibodies (step 10). 11. If background fluorescence is found to be a problem, the secondary antibodies can be preadsorbed on larval brains dissected, fixed, and permeabilized as described in steps 1-6. For example, dilute the secondary antibodies 1 : 8 in 3 vol of blocking solution for every volume of fixed tissues and incubate for 2 h at room temperature (12).